University of Wisconsin Badger quarterback John Stocco (pictured) has accepted an offer from the Green Bay Packers to attend their Rookie Orientation Camp this weekend for a 3-day tryout. 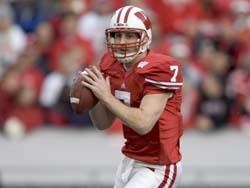 Stocco was a three-year starter with the Badgers, going 29-7. UW-La Crosse basketball standout Joe Werner will also get a tryout this weekend as a tightend. He hasn&apos;t played football since his sophomore year in high school at Chippewa Falls McDonell.